Inventory We are a resale marketplace, not a box office or venue. Ticket prices may exceed face value. This site is not owned by Arlene Schnitzer Concert Hall . The Arlene Schnitzer Concert Hall was added to the National Register of Historic Places in 1978 after having been open for over 50 years. The Arlene Schnitzer Concert Hall box office is located at 1037 SW Broadway in downtown Portland, Oregon. Known for many years as the Paramount Theatre it has a seating capacity of 2,776 and underwent the last major renovation in 1984. The venue plays host to mainly traveling artists and smaller family shows. The biggest traveling Broadway shows play at the Keller Auditorium. 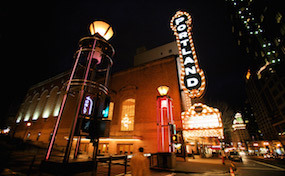 ConcertHallPortland.com is an independently owned and operated company that concentrates mainly in all events in the online resale secondary market. We are not associated with any official website, venue, box office, and or supplier. Prices on our sites tend to be above face value and will change quickly with demand. To order tickets to all Arlene Schnitzer Concert Hall events please follow the steps online through checkout or pick up a phone and call our representatives at your earliest convenience.